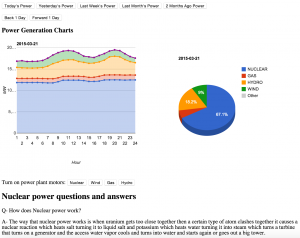 How do you visualize Ontario’s power generation in real time? Ask a grade 6 student! ** UPDATE: Sign up for the STEAMLabs email list to be notified when the free classroom activity guide showing YOU how to run Internet of Things teaching activities is ready! Many people blame technology for the lack of engagement in schools. After all, why would children want to learn when they can play iPhone games? Here’s the thing: children are eager to learn about things relevant to them. Often students lose interest in school because they don’t understand how the knowledge is relevant to their lives. So how can we make lessons relevant? The answer is simple: connect classes to the technology they’re already interested in. The model power grid displayed here is a great example of exactly that. 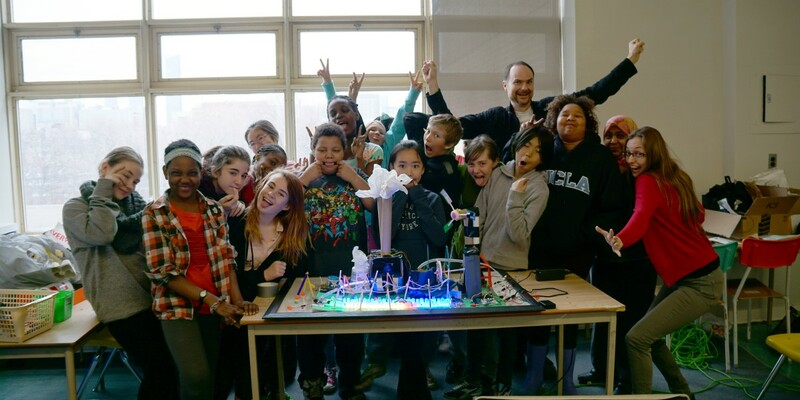 An inner city Toronto sixth grade class from the Downtown Vocal Music Academy in Ryerson Community School used 3D printing technology, LED lights, Arduino compatible Spark microcontrollers and their own craft skills to create it. 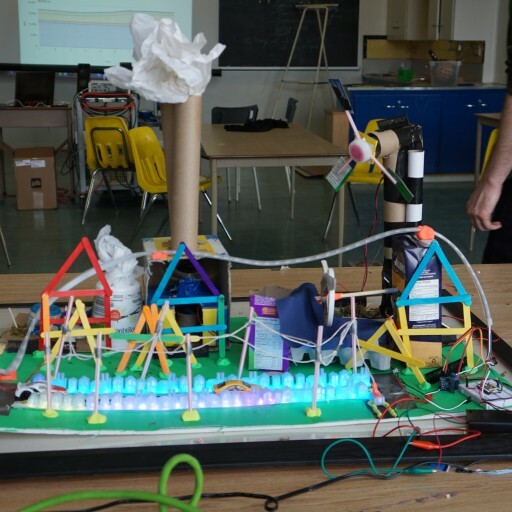 We started off the kids with a goal – to build a science centre type exhibit to teach the public about Ontario’s power generation system in an interesting and engaging way. We told them that this is more than a school project, they are now real exhibit designers. Kids can do anything that adults can do if they put their minds to it. It was an ambitious project, and the students rose to the challenge and exceeded our expectations! 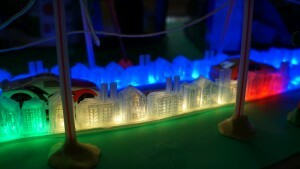 Students were given three weeks to build the model power grid shown above and divided up into six teams: one for each of the four primary power sources used in Ontario, one dedicated to the 3D printed buildings representing the power consumers and the final team to program the LED lights and web interface. The power generation stations were built with a variety of reused and recycled goods. Each one features working parts powered by small motors the students installed themselves. A “kinetic-energy” team self formed to help the other teams with the motors and mechanical parts. At times the process was frustrating, but the students stuck with it. You would have been hard pressed to find a class more focused on a Friday morning. During the second Friday workshop, most of the students even chose to skip recess, opting to finish their power stations instead. With their laser-like focus, the functional power stations were all built in one three hour session. The excitement was almost tangible as students set their projects aside for lunch. Everyone was excited by the 3D printer! 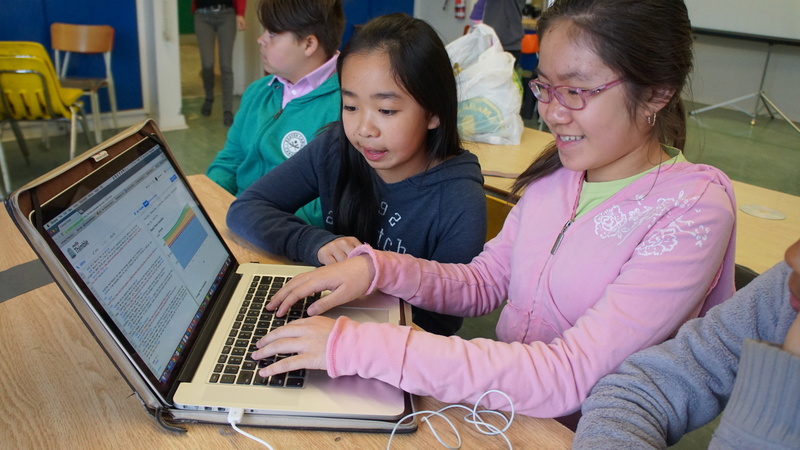 Everyone learned to use TinkerCad, free web-browser based software from Autodesk for making 3D objects. After learning the main power consumers in Ontario – residential, commercial, industrial, agricultural and transportation, they got to work designing at least one representation of each. Since Tinkercad is browser-based, the students continued to work on their 3D models at home, too. One student even spent several classes creating a model streetcar, no easy feat when you’re working with a medium where the final product is only be a few centimeters tall. 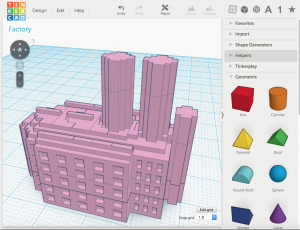 One student used Minecraft to model a factory, using the Cura software program to export the 3D model for printing. Most kids this age already know Minecraft, so this is a great way to introduce them to 3D design. Finally, once all the models were done, the power consumer team did the math to figure out how many of each type of building needed to be 3D printed to proportionally represent the mix of power consumers in Ontario. 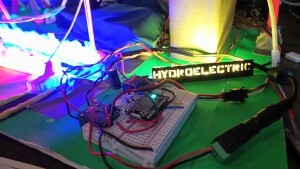 The Spark Core extends the Arduino environment with a connection to the Internet. These kind of smart, networked devices are known as The Internet of Things (IoT). Companies are at the beginning stages of developing these kinds of devices, with fitness sensors, home automation systems, pollution monitoring systems, electricity usage optimizers and much more. It’s already a multi-trillion dollar industry, and is growing fast. The Internet of Things is also an excellent teaching platform for teaching web development in an interesting and challenging way. With funding and help from the Canadian Internet Registration Authority (CIRA) Community Investment Program, STEAMLabs has developed an Internet of Things Teaching Kit. You can view and download the IoT teaching kit on our Resources page. One of the core tenets of experiential learning is allowing the kids to follow their own interests. You are much more engaged when you are learning things that you’re excited about! So while the kids were working on their 3D printed buildings, they were all given the option to come try out some Arduino programming. Almost half the class did so, and learned the basics by experimenting with sample code. Out of that group, three girls and one boy banded together to form the programming team. 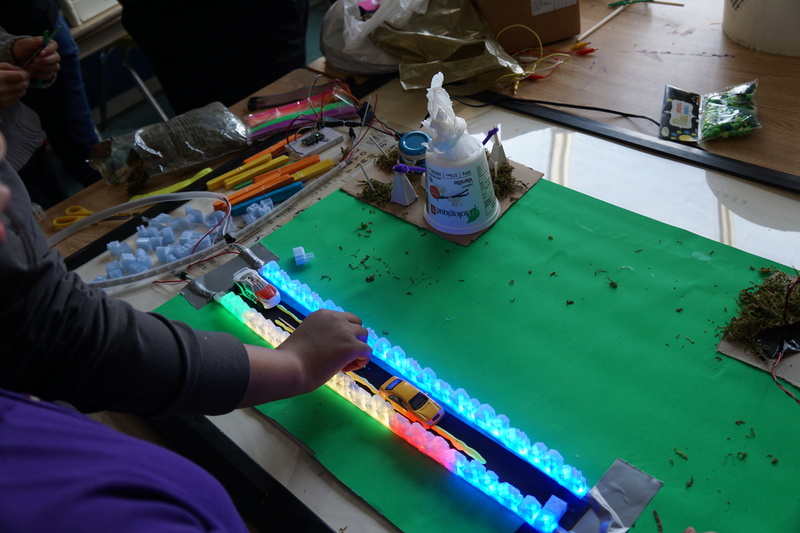 Their first job: to light up the LEDs with different colours to represent the four primary sources of power generated in Ontario: blue for nuclear power, red for natural gas, yellow for hydro-electric dams, and green for wind power. 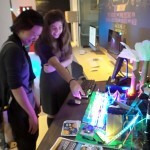 They used the Arduino language to program the Spark Core microcontrollers to control LED light strings with different colours. In no time, they were lighting up all the different colours required. Last but not least, they connected the web interface to the model power systems, allowing visitors to turn the motors on or off, either one at a time or all at once. You can view their completed web interface here, and control the model yourself! 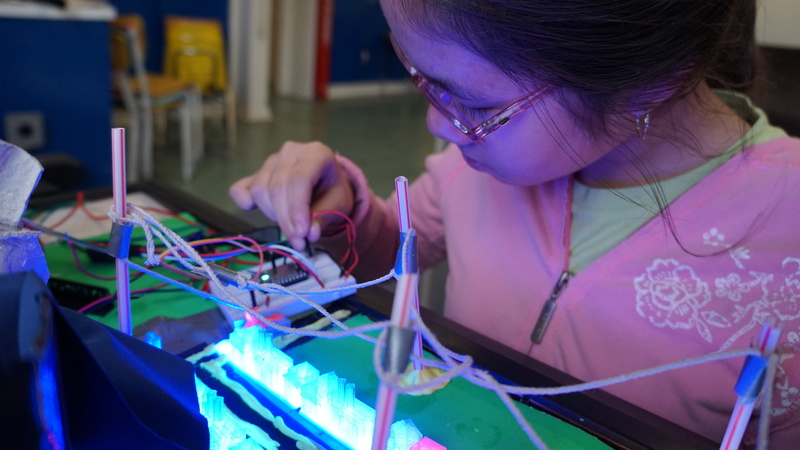 You’re probably already thinking that this is the coolest school project you’ve ever heard of–especially at the elementary school level–but there’s actually more to the story. 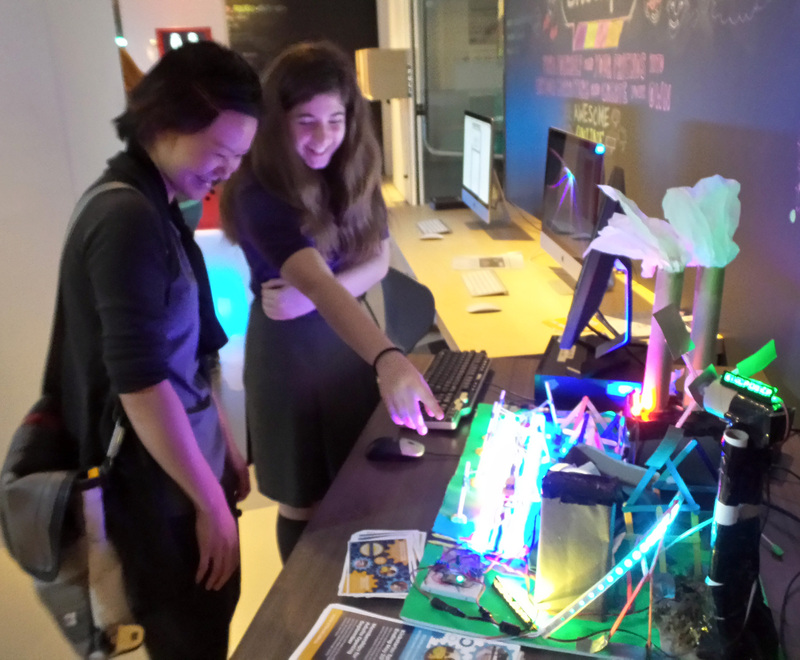 During the first Friday morning session, workshop leader Andy Forest announced that the TIFF Bell Lightbox had put out a call for exhibits made by children for their DigiPlaySpace exhibition — and this model power grid was exactly the kind of thing they were looking for. The excitement in the room was tangible as Andy made the announcement. If they completed the power grid within a few weeks, students would have the opportunity to present their work to hundreds of people at a Toronto landmark. We’re happy to report that the class worked very hard, completed the model, and it was accepted into the TIFF DigiPlayspace exhibition! They were so proud and empowered by this experience. They ran the show and used the model to teach adults and kids alike about the power grid. 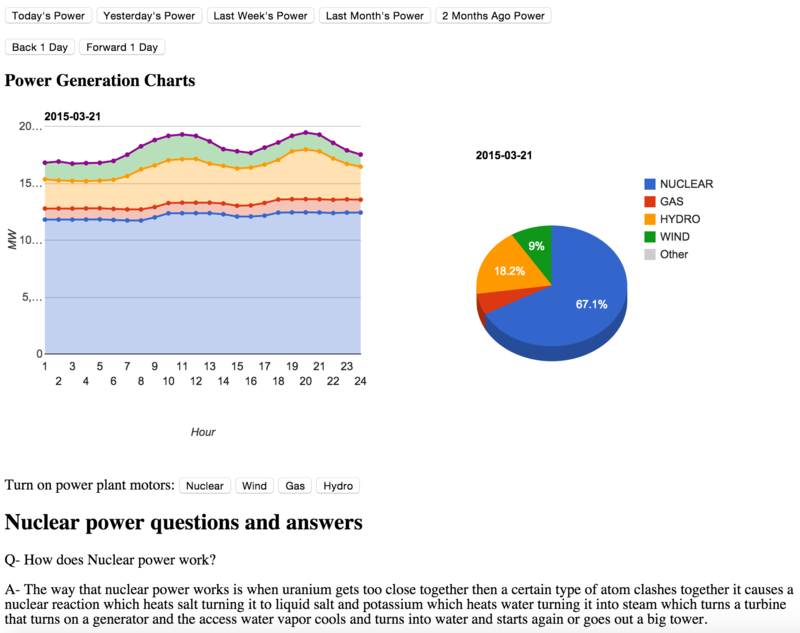 You know that this kind of hands-on experiential learning works when you hear an 11 year old girl confidently answering an adult visitor’s complex questions about nuclear power plants! The TDSB was so impressed with the final results that they featured the project on the TDSB website! This model power grid is more than just that: it’s an example of how creative and capable children can be if we give them the opportunity. It’s also a great example of how hands-on projects clearly relevant to students’ lives can capture their attention and imagination. None of these kids or their teacher had been exposed to these technologies before, but by the end of the 3 week build, they were naturally using them to solve problems. For example, the Wind team had trouble securely connecting their propellor to a motor shaft, so the 3D Printing team designed and printed them a linkage to solve their problem. Many educators have difficulty in measuring the success of using emerging technologies in the classroom. Seeing these kids’ apply their knowledge and problem solve is the best metric we can think of to highlight their value! Their teacher Abby Pierce loved this project because with us bringing the technology, she had a new super-engaging way to teach a whole bunch of curriculum topics in an integrated way. STEAMLabs was created with the goal of helping young people tap into their creative potential and become inventors of the future, both through programs in our own space and in the classroom. Our workshops and classes leave students with creations they can be proud of, skills they’ll use for the rest of their lives, and new confidence. Sign up for the STEAMLabs email list to be notified when the free classroom activity guide showing YOU how to run Internet of Things teaching activities is ready!